I decided to give my blog a make over, it was looking very un-laurafallulah-esque all plain white and grey so now it is pretty in shades of pink, red and green. I also thought while I was making it all colourful that I should try and learn a bit more about blogger and what I can do with this thing. So I have added in a etsy mini showcase for my supplies shop and also a list of all the blogs that I follow, I will add in more later when I have more time. I know to most of you this all sounds very easy, but those who know me will know that this is not easy for me as I am not great with computers. I am one of those people who can type lightning fast but ask me to change something and im screwed. One of my new years resolutions was to get better at the sides of my business which I think I am weaker at and computer based work is definatly one of those sides. 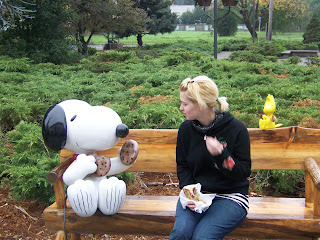 Also just because I cant have a post without something visual here is a picture of me talking to snoopy with woodstock hanging about in the background. and i think i owe you a belated HAPPY BIRTHDAY!!! oh I like it. yes this is definitely much more you. well done on conquering the tecnhphobia!